Need a sample pack? Please call us at 877-763-7671 today. Choosing a printer to create your organization's marketing materials is a huge decision. At Color FX Web, we encourage you to thoroughly research your prospects and request a printing sample before choosing the one that’s best for you. The last thing you want to do is invest a great deal of time and money into a printer that falls short of your expectations. Request a Printing Sample Pack Our team is very confident in our printing abilities. We’re more than happy to provide you with a printing sample so you can see what we have to offer. Enjoy the ability to preview our high-quality service and close attention to detail with absolutely no obligation to choose us. We’re so confident in our capabilities that we’re certain you’ll be impressed. Every company should be more than happy to provide you with a sample printing piece. In fact, you might want to think twice about using a printer that won’t offer you a sneak peek at what they can do for your company. 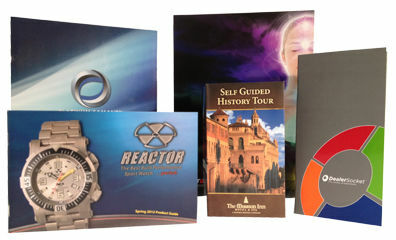 Printing companies that are confident in their ability to do the job correctly are proud to showcase their abilities. In fact, here at Color FX Web we want you to see our work before you decide to work with us! It's important to make a well informed decision on something as important as the quality of your printed marketing materials. These products have the power to make or break a customer’s first impression of your business, so you want to make sure they’re done right. A printing sample allows you to see what to expect for your finished product. Enjoy Personalized Service Color FX Web is committed to providing you with more than just outstanding printing services. It’s our goal to offer you first-class customer service throughout the entire printing process. We know that many printing companies suffer from a lack of communication with their clients, but you don’t have to worry about that with Color Fx Web. When you submit a request with our company, you’ll be greeted by a real live person — not an automated email or an impersonal chat service. Our representative will introduce you to our company and provide you with an overview of our printing process. You’ll be assigned a dedicated customer service representative, who will see your order through from start to finish. We understand how frustrating it is to have to ask the same question to several different people to get a response, and we promise you won’t get that with Color FX Web. You’ll be given the contact information of your account representative, so you can contact them at any point in the process with questions or concerns. When you have one point of contact for your account, it’s much quicker and easier to have your questions answered and know exactly where your print job stands in the process. Our team is focused on providing you with the best possible customer experience. Want to see a sample of our work? Contact Color FX Web today. ColorFX loves custom orders! If you need custom size, stock, ink, coating or something else - let us know! Our printing experts will check your order's specifications, and give you a quote right away.